For me, one of the best things about living here is the Mercado Municipal. Every major city has one. If you love food, or love to cook, this is the place for you. One stop shopping. Fresh fruits, fresh fish, fresh spices, fresh meats, you name it. Most of the local restaurants will get a lot of their ingredients at one of these markets. The mercado municipals in large cities, like São Paulo City or Rio, are enormous. Others, like the one we went to in Campinas yesterday, are about the size of a Costco. The market in Campinas was opened in 1908 and is the oldest "shopping center" in Campinas, has 143 shops, 98 in the main building and 45 stalls in the outer buildings. Where the fishmongers are now is the platform next to where the railroad tracks used to be. Dried beans and more dried beans. Every type of bean you can think of. You name it, they have it. Every spice you can think of. Every dried fruit and nut you can think of. Hot Sauces and Soy Sauces!! More bacon and linguiça, which is what Brasilian sausage is called. And there are so many different linguiças, it's crazy - fresh, smoked, spicy, pork, beef, even chicken. Fresh fruit. Every type of fruit you can think of. And about 4 different bananas at any given time. This cauliflower, which was bigger than my head, cost only $2 US. Sardines. About $3.50 US for 2 pounds. I never even knew sardines came this big. The fish guys always love having their photo taken with a giant fish. Man, I took lots of photos of fish. But the best part of the Mercado Municipal was finding this giant gourd at an African religious store. The seeds are dry inside and the gourds here are used as part of a brasilian instrument called the Berimbau. I put Tim's scissor in the photo so you can get an idea of the size of this gourd. Hope you guys enjoyed this post. Let me know!! Last week I got a message from my friend, Jen del Muro - the brains behind, and owner of Reverse Confetti. (Psst, it's an amazing rubber stamp/die company - check it out!). Anyway, she told me that her kids (Nic and Ellie) were going crazy over the World Cup and asked if I would be able to pick up a few things for them. Duh! Of course I can. So I went shopping. Was able to find some t-shirts, stickers, bandannas, and water bottles, and packaged them all up in a box. 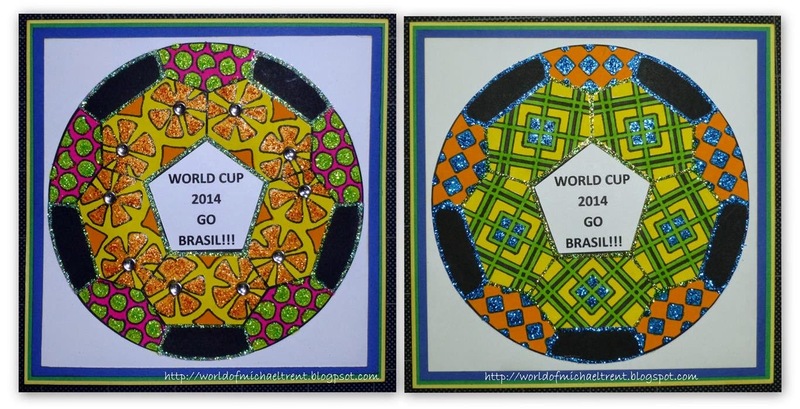 But then I thought, "they need StenDoodled World Cup Soccer Cards"!! So I made two - Nic's is on the left at top and Ellie's is on the right. And now you can make some too if you want - easy and fast!! Step 1. 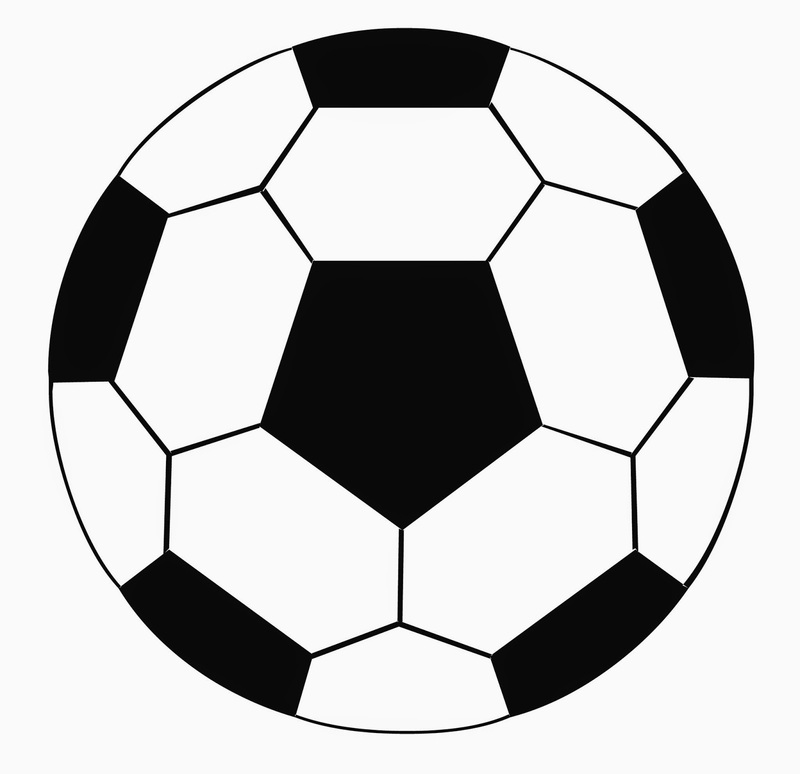 Download and print the soccer ball. I use Picasa and I printed two at 5"x 7" on an 8.5" x 11" piece of cardstock. You may need to use the "Shrink To Fit" button. Step 2. Cut your papers. Your white card base will be 5 3/8" x 10 3/4" and score in the middle at 5 3/8". 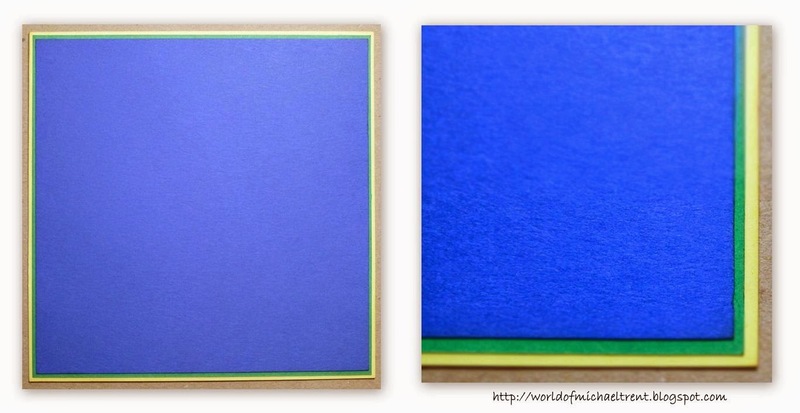 Yellow base cardstock is 5 3/8" x 5 3/8", Green is 5 1/4" x 5 1/4", and Blue is 5 1/8" x 5 1/8". 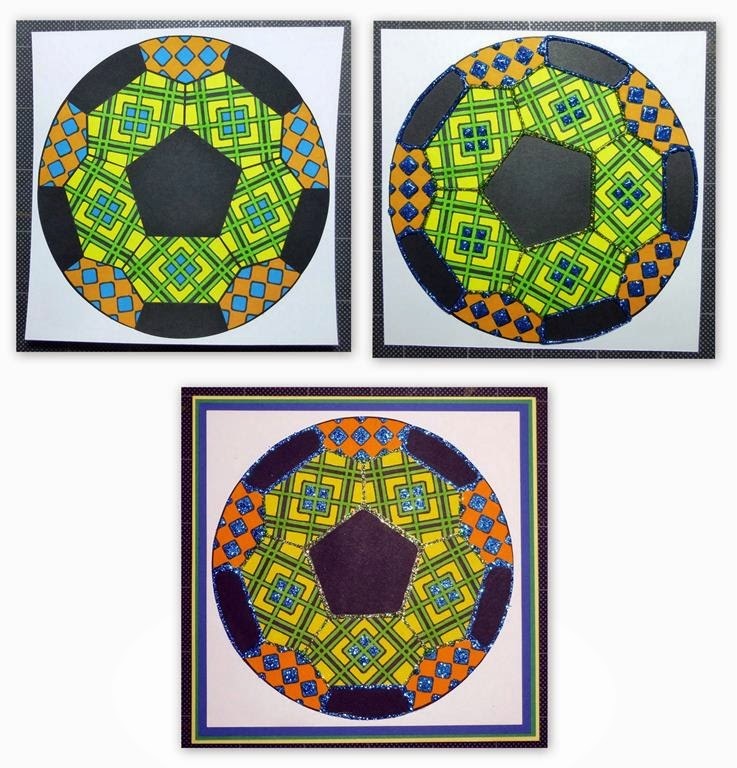 Cut the printout of the soccer balls in half at the 5 1/2" mark. Step 4 - Now to work on the outer white areas of the ball. Lay the Journal Texture No. 2 stencil in one of the sections and trace the pattern with the Sharpie. Continue around the ball until all of the outer areas have been done. Step 5 - Now to work on the inner white areas. Lay the Blades stencil in one of the sections and trace with the Sharpie. Do the same to all the inner white areas. Make sure you look at the stencil to get the area and look you want in each section. Step 6 - Now color the ball. I used Tombow Marker Nos. 025, 055, 133, 725, and 985. After I colored it, I measured the ball (it measures 4 5/8") so I knew I needed to cut about 1/8" around all 4 sides. Then I adhered it to the blue cardstock. Adhere a small crystal to the inside of each "flower". Then apply Firefly Stickles to the green circles in the outside areas and Spiced Marmalade to the inside flowers. Then outline each of the black areas with Crystal Stickles. Allow it all to dry! 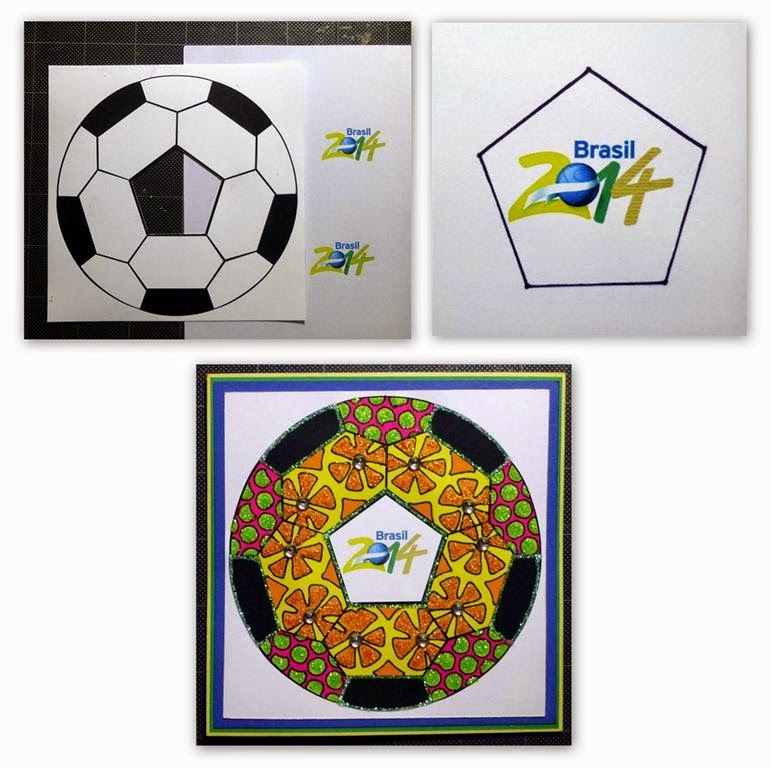 Step 7 - For the phrase, first I did a search on Google for World Cup 2014 logos and downloaded a free one. 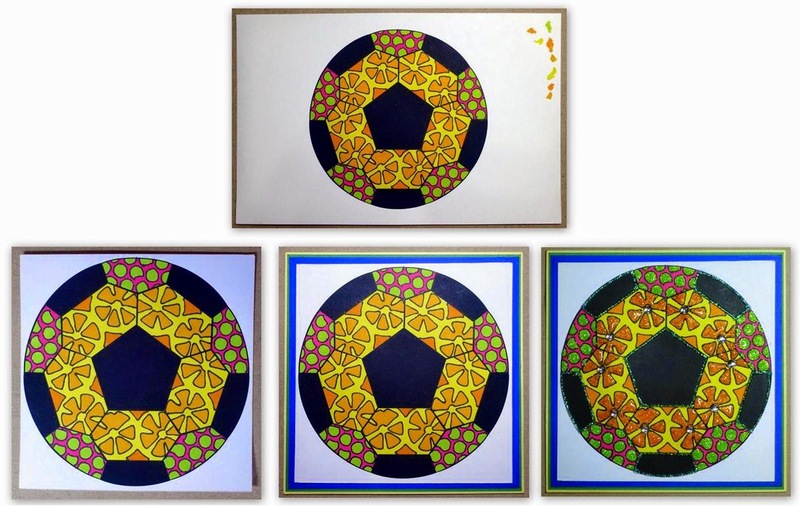 Then, in the 2nd soccer ball that I printed, I made a mask by cutting just inside the center black area with an X-Acto knife and ruler - to create a window. Step 8 - Print the logo on cardstock, place the ball template over the logo with the window over the phrase, trace and then cut out. Apply tape or pop dots on the back and adhered to the center of the ball. Steps 1 through 3, above, are the same. 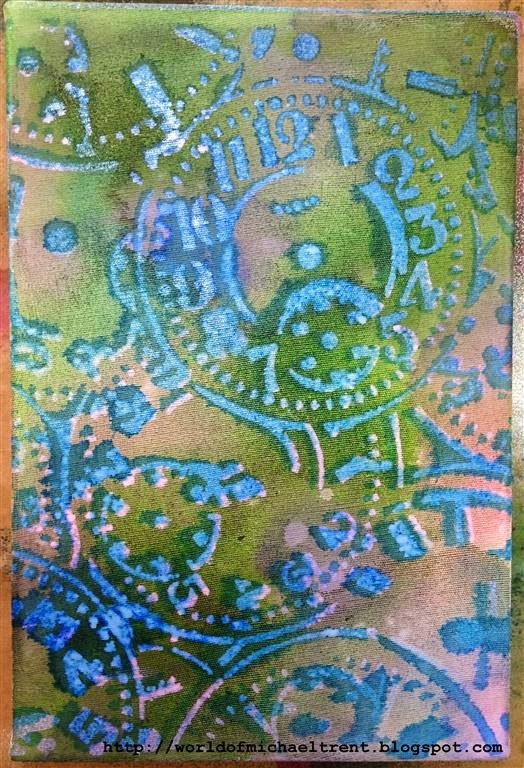 Step 4 - For the outer white areas, trace the Journal Texture No. 2 stencil with the black Sharpie. Step 5 - For the inner white areas, trace the Mini Square Clover Leaf stencil with the black Sharpie. Steps 6 - Color the ball. I used Tombow Marker Nos. 055, 195, 443, and 985. Trim the ball as in Step 6 above and adhere to blue cardstock. Then apply True Blue Stickles in the outer squares and in some of the smaller ones in the center. Apply Lime Green Stickles on the thin lines to separate the sections of the ball. Allow it all to dry! Step 7 - Same as above. Cut phrase using mask and adhere to card front. Hope you liked!! Go Brasil or USA!!! Download a free Soccer Ball Printable found on the Internet - or right click and save the image below. Brasil - This Is One HUGE Pig! I just had to share these photos on my blog. I have a thing for pigs. Dunno why, but I do. While bike riding the other day I finally had a chance to take photos of this pig (hog?). There is a family in town that got a small pig one year. Their idea was to fatten her up until it was time to kill her for their many months of dinners. But, they fell in love with her and could not go through with it. So, the piggie lives there with a bunch of their dogs. Sleeps all day and at times has a rope leash on her. She is just too cute and I wanted to share. 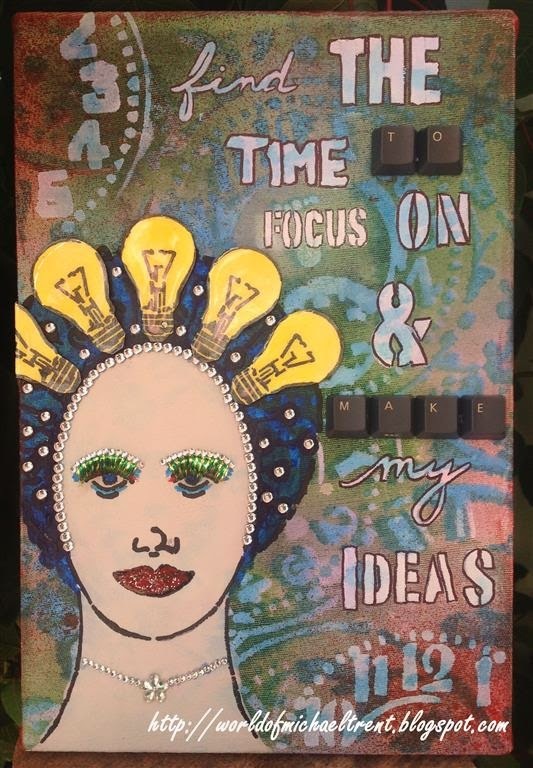 When I was first approached to be part of the StencilGirl/Craft Hoarders Anonymous Challenge blog hop, I just laughed out loud! Me? A craft hoarder? Duh! Not only have I been hoarding craft supplies for over 20 years but when I moved here to Brasil from New York City, I took it all with me. And then I started to hoard Brasilian craft supplies. Okay, I admit it - I AM A CRAFT HOARDER! 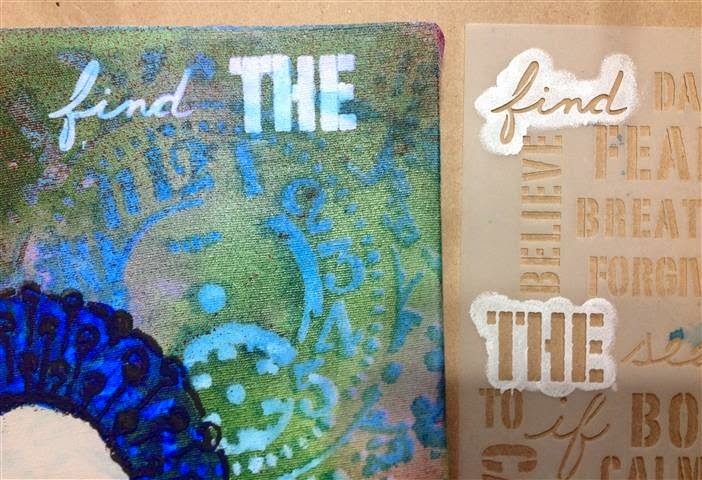 For this blog hop, the artists had only two rules - use StencilGirl stencils and then to dig through our craft hoard and use whatever we wanted to use. I grabbed stencils (duh) sprays, pastes, paints, makeup sponges, lots and lots of BLING, you name it. Heck, I even grabbed my bag of keyboard letters and some fake eyelashes that were in the hoard. Told ya, I am a craft hoarder. There is something very freeing about just using stuff from my hoard and making a piece of art. I did not do much thinking here. I did know what stencils I wanted to use and then I just pulled stuff out of the hoard to use with the stencils. I had soooooo much fun working on this challenge/piece! I even gave her a name. Bella Bulb!! DON'T FORGET ABOUT THE GIVEAWAY!! MAKE SURE YOU CHECK OUT THE PROJECTS ON TODAY'S BLOGS, BELOW, AND LEAVE A COMMENT TO BE ENTERED IN THE GIVEAWAY!! Now, wanna make Bella Bulb? Steps 1 through 4: The Canvas Background. Cover the canvas with a coat of Gesso. Allow to dry or heat set. Grab a bunch of sprays. I am a little low on my Dylusions sprays and, since I do not have the luxury of a Michaels near me, I went to my "Hoard". I found a bunch of sprays from Stamp Zia (no longer in business but very much missed) and a bunch of Mister Huey's sprays by Studio Calico. So I grabbed them and just started to spritz away! Heat set but removed excess in areas with a paper towel. 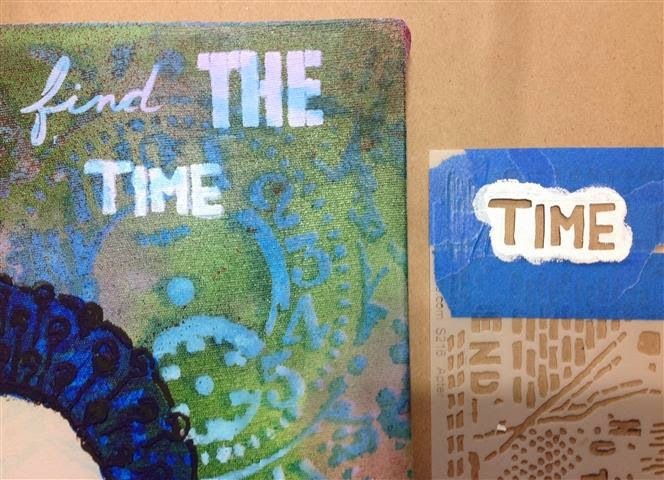 Then I placed the large Clock Face stencil from the StencilGirl Club) over the canvas and sprayed the London Blue Dylusions through it. Removed stencil. Heat set. Then washed stencil. Place (washed) Clock Face stencil over the canvas again, in the same exact position, and spray with the Calico White Mister Huey spray. You will need to shake well and get that ball inside bouncing. I wanted a "muted" London Blue color to come through. Heat set. So far, this is what I have - I kinda like it just the way it is but...this being a post about using your hoard, I gotta keep going!! Step 5 and 6: The Head and Face Outline. Place the open part of the Face Map Version 2 on left side of piece. Hold in place and coat inside with two coasts of gesso. Heat set, wash stencil, and then do again with a skin colored acrylic paint (I used a Brasilian brand). Then I mixed some molding paste with some black acrylic paint and used a spatula to apply the mixture through the outline side of the same stencil. I did not want a strong black outline and the mixture helps achieve that. 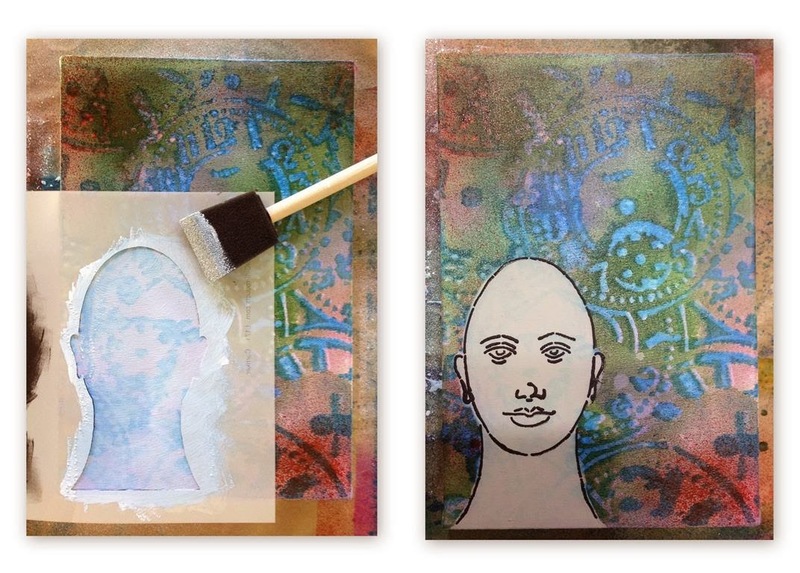 Place the "mask" - the solid face part from the Face Map Version 2 stencil- over where you painted. I placed it about 1/16" below the outline. 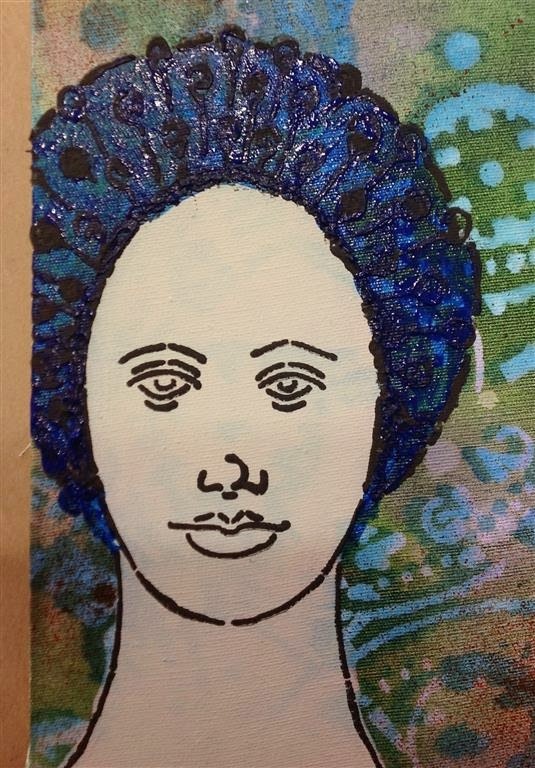 Then I placed the 6" Peacock stencil (from the January 2014 Club Kit) over the mask. Using the same molding paste/black paint mixture from Step 2, above, use a spatula and apply this mixture through the peacock feathers - in order to make the "hair". Step 10: Paint the hair. I mixed a bit of blue acrylic paint with just a hint of H2O and filled in the hair. You still see the designs on the canvas, which is what I was aiming for. 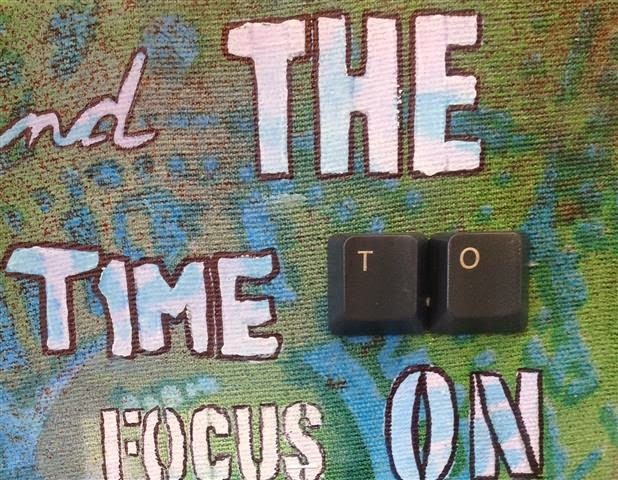 Using white acrylic paint and a makeup sponge, I placed the word "find" on the canvas where I wanted it and applied the paint. Allow to dry or heat set. Now, because I did not use gesso first, I had to do this for the words 2 or 3 times until I got the level of white that I wanted. Next up was the word "THE". Did the same with the paint. 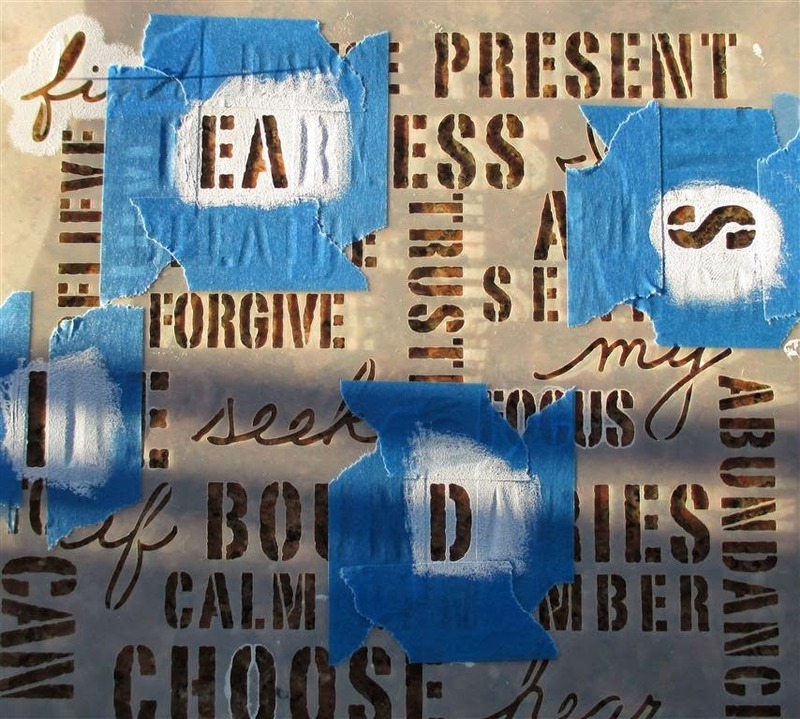 For the word "Time" - using painter's tape, I masked off the word Time from the word Timeless on Seth Apter's Timeless stencil and applied the white paint through it. 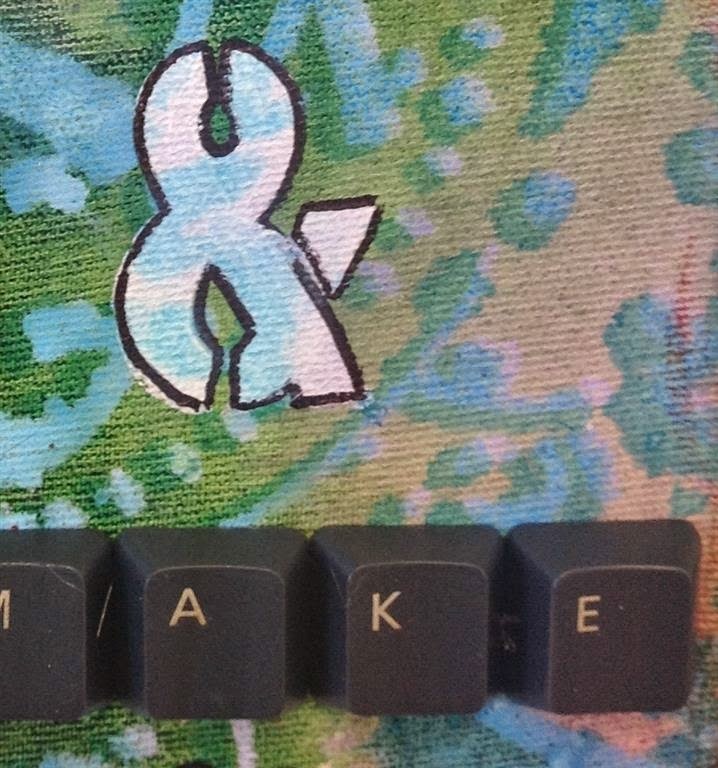 For the words "TO" and "MAKE" - I dug through my hoard because I knew I had some old keyboard letters. Using a hot glue gun, I adhered the letters down when I got to that area. 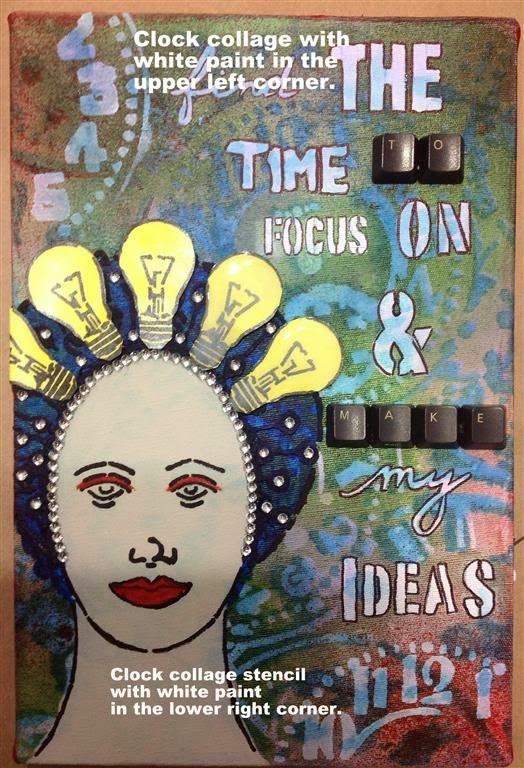 For the words "ON" and "Ideas", I just masked of the letters I wanted to use and applied the paint through each letter. I heat set between applications and letters. **After all the words were done, the paint applied and dried, I went back with a black Sharpie pen and outlined each of the letters. 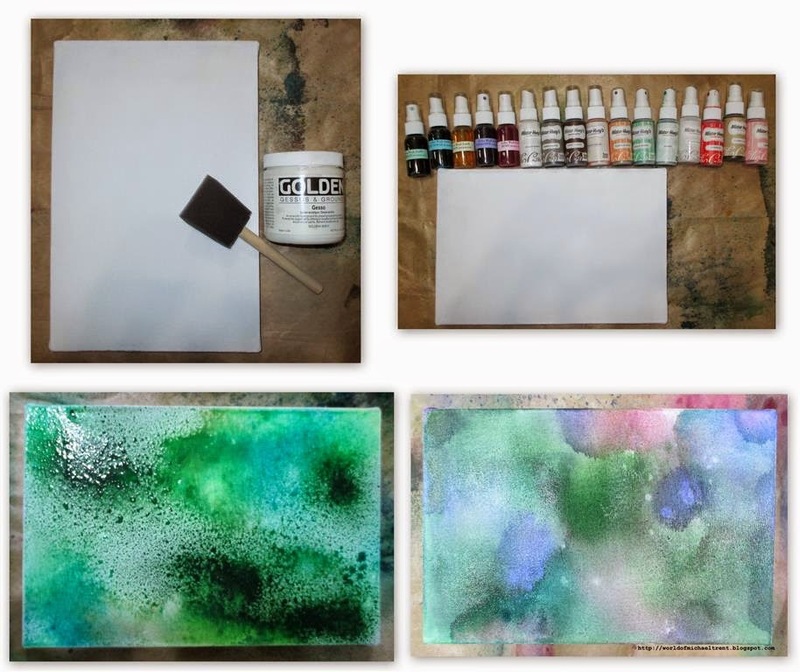 Mix a small amount of yellow acrylic paint with a hint of H2O and spread it over a piece of white cardstock. Allow to dry or heat set. 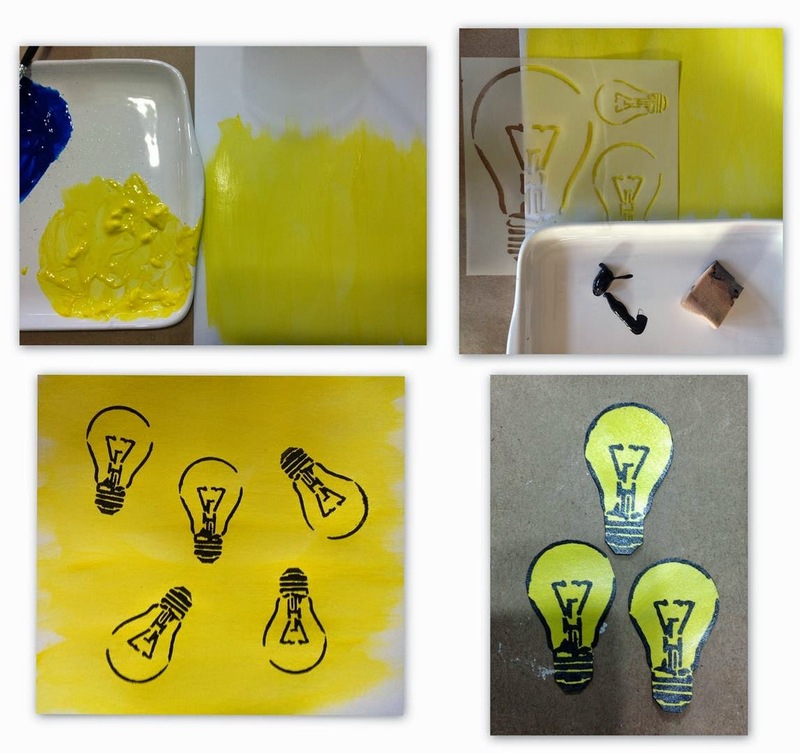 Now lay the Lightbulb stencil on the paper and, using a makeup sponge and some black acrylic paint, apply the paint through the smallest of the lightbulbs. I did this 5 times. Heat set. I then applied a light water-based sealer/varnish over the bulbs. Heat set again. Cut them out. (Note: the photo below shows that I only cut 3 of them out but I ended up cutting and using all 5 in the final piece). Using the hot glue gun, I applied some glue on the back of each bulb and adhered them around her face in her hair. I did not go below the hairline. 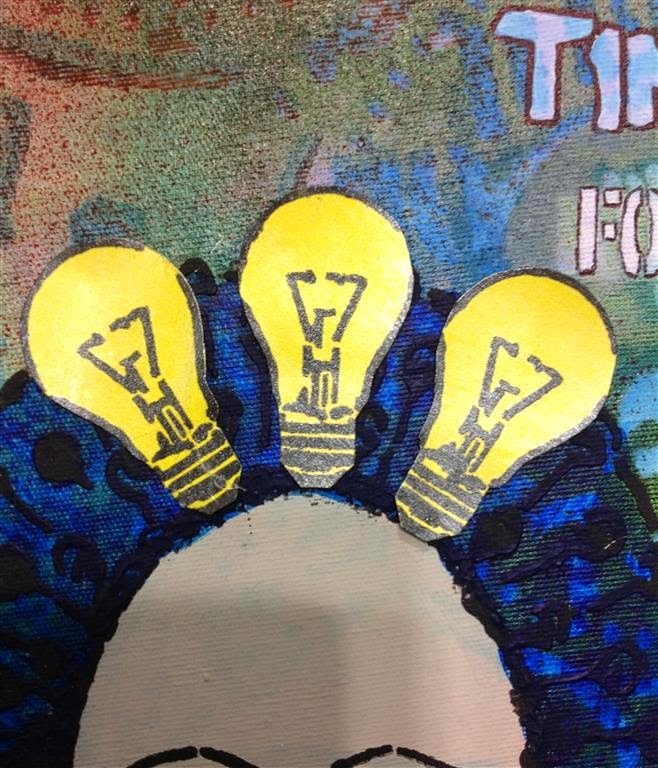 And, although the photo below shows 3 bulbs, I did use all 5 of them. Step 13: The Bling and Shiny Stuff! Bling!! Enough said. 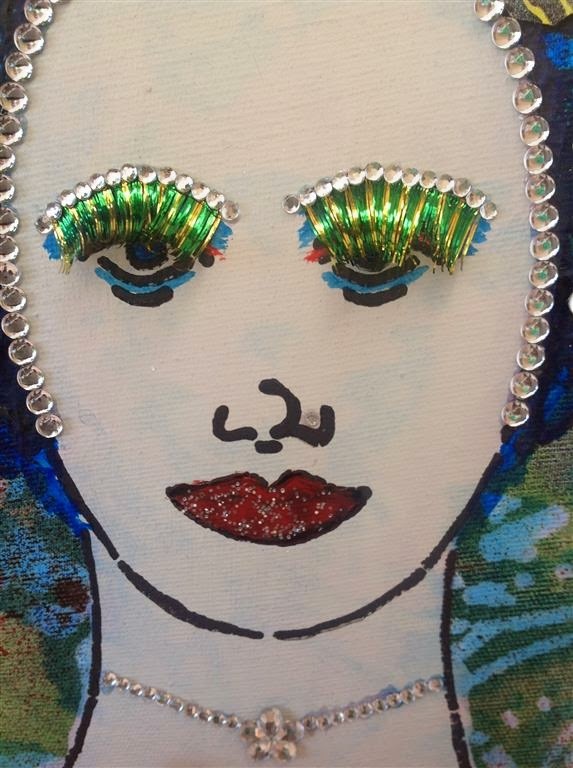 Using Glossy Accents, I applied Bling around her face, along the hairline. Also applied a few pieces of Bling in her hair, here and there. And I made her a necklace of even more Bling! I also gave her lips some red paint and, after it dried, applied some Glossy Accents with a bit of glitter. Then it was applying the fake eyelashes with more Bling! Oh, and a smaller Bling in her nose. What the heck!! And, since I knew all of this would be drying overnight, I applied a coat of Glossy Accents to each of the bulbs to give them a glass effect look. Because I felt there was something missing, I placed sections of the Clock Collage in the upper left and lower right corners of the canvas. Applied some white paint through the stencil and felt this balanced the whole piece. I also went and painted the 4 sides of the canvas in red paint. And that my friends is it! Man, if you really read and got this far, please leave me a comment!! I know my tutorials tend to be long but once you do a project of mine, you realize I just want to make sure you understand everything I did and how I did it!! Thanks for letting me share this with all of you. Hugs!! 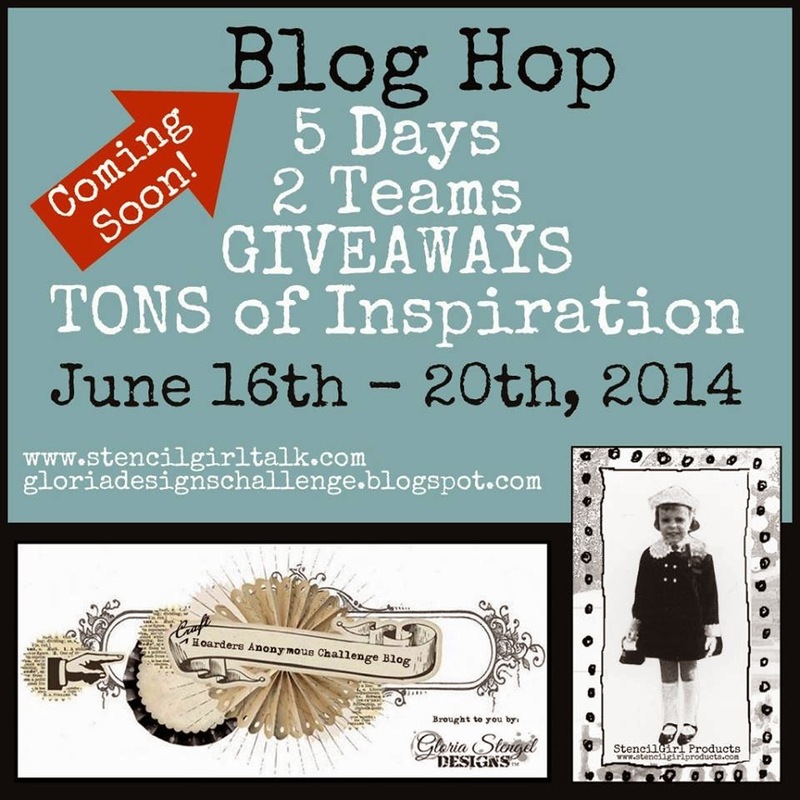 Starting on Monday (June 16th) - an amazing WEEK LONG Blog Hop with StencilGirl Products and the Craft Hoarders Anonymous Challenge Blog! !